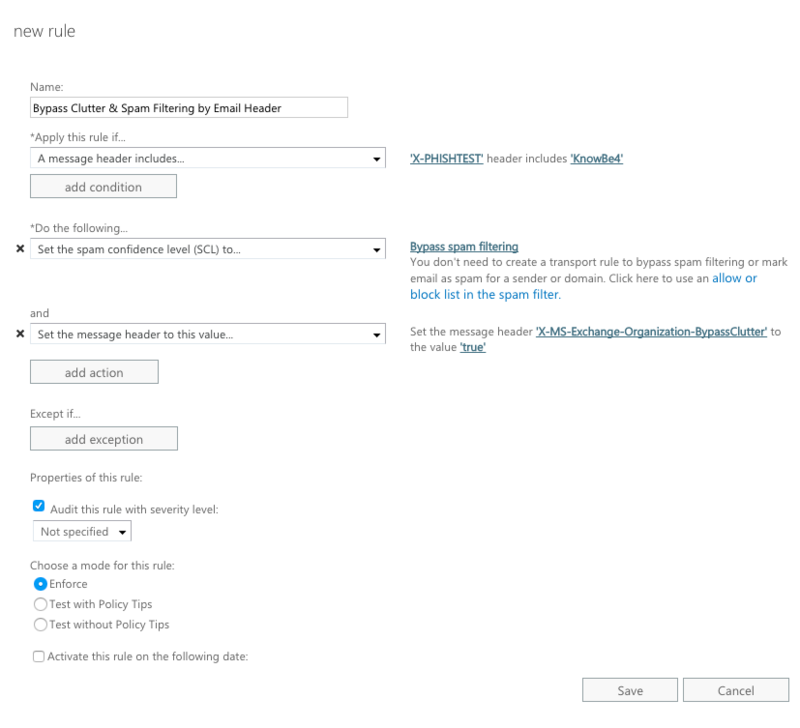 Office 365 Environments: If you whitelisted our email servers prior to February 2018, you will need to add an additional mail flow rule in your Office 365 Admin center. This rule can be found in Bypassing the Junk Folder. This article will cover how to whitelist simulated phishing test email headers in your Exchange 2013, 2016, or Office 365 environment (the process is the same for each of those three mail servers). To whitelist our training emails, visit our Whitelisting Training Emails in Office 365 article for more information. Whitelisting is necessary in order for us to send simulated phishing emails that will bypass your mail filter. We recommend whitelisting by IP address or domain but depending on your system setup (for instance, if you're using a cloud-based spam filter), whitelisting by headers may be the most suitable way to ensure phishing test emails are delivered to your users. This filter will allow those simulated phishing emails to bypass your filter by whitelisting our email headers. We will also make sure that we bypass the Clutter folder in Microsoft's Exchange Online Protection (EOP) mail filter with this rule. Once your settings are in place, it may take some time for those settings to propagate. We recommend that you wait 1-2 hours and then set up a phishing campaign to yourself or a small group to test out your new whitelisting rule. The instructions for setting up these rules are shown below (the below instructions show screenshots for Office 365). Alternatively, you can watch our video on whitelisting by email header in Office 365 here. Log into your mail server admin portal and go into the Admin > Exchange area. Click on the mail flow section and then click the big + sign in the right-hand area and select Bypass Spam Filtering… from the drop-down. This will open the New Rule screen. 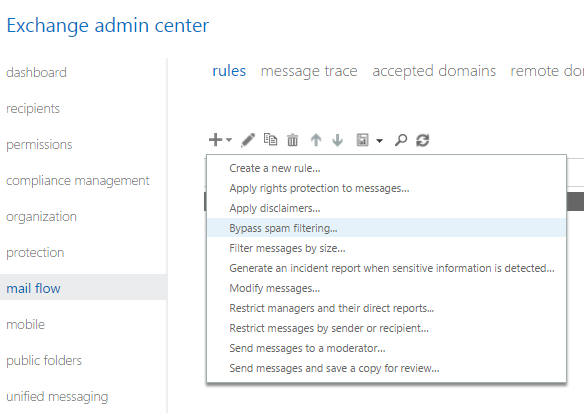 Give the rule a name, such as Bypass Clutter & Spam Filtering by Email Header. Select Apply this rule if… then choose A message header > includes any of these words. Click the Enter text and type in the header X-PHISHTEST and then click Enter words … and type in KnowBe4 and click the big + sign. Next, under Do the following… ensure that this field is set to Set the spam confidence level (SCL) to… and Bypass spam filtering is set on the right side. Add a second action to Do the following… to Modify the message properties > set a message header and ensure you set the message header to X-MS-Exchange-Organization-BypassClutter then click Enter text... and type true. Once you have completed this setup please allow time for the new rule to propagate, and then set up a test phishing campaign for yourself or a small group, to test out your new whitelisting rule. For best practices, we recommend leaving the other options at their default settings. This rule will allow only simulated phishing emails from us to bypass the Junk folder to ensure that your users are receiving simulated phishing emails in their inboxes. Go to Admin > Mail > Mail Flow. Click the (+) Create New Rule button beneath Mail Flow > Rules. Give the rule a name, such as KnowBe4 - Skip Junk Filtering. Select A message header > includes any of these words. Click the Enter text and type in the header X-PHISHTEST and then click Enter words … and type in KnowBe4 and then click the + sign and OK. Beneath Do the following, click Modify the message properties then Set a Message Header. 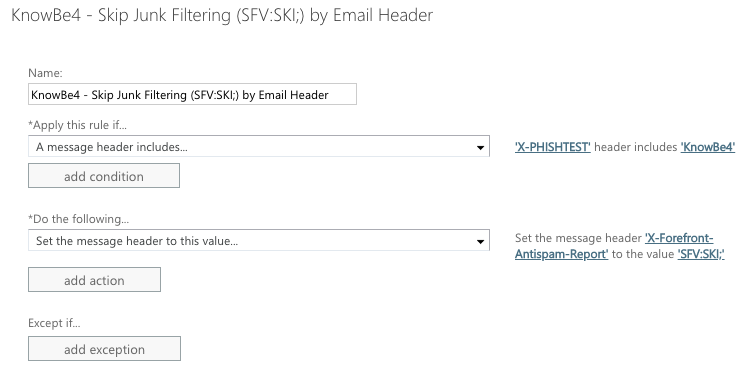 Set the message header X-Forefront-Antispam-Report to the value SFV:SKI;. To learn more about this header, click here. Beneath Properties of this rule set the priority to directly follow the existing rule (outlined in Section 1) set up for KnowBe4 whitelisting. Click Save. An example of the completed rule is below.